My roommate Brian and I went on our first pilgrimage of the year to Christina’s Homemade Ice Cream last night. I left the apartment in sandals and a thin cardigan (to clear any possible confusion – I was wearing other things too!). The night air was so warm and soft – it was like a gentle hug from mother nature. Spring is unpacking her bags, and she’s here to stay. I am crossing my fingers and hoping this nice weather will lure me outdoors more often. So far I am not getting off to a good start on account of I was being held hostage at work on Friday for twelve hours by my inner taskmaster. The alternative was to leave all my work for Monday, but that would have made me even more sad. Ending that long day with ice cream was just what the doctor ordered. This past week was concentrated with delicious food and amazing company. I had the privilege of meeting two of my favorite food bloggers in person. It was such a treat, and I am still recovering from being starstruck. Betty of Le Jus d’Orange and I got together at one of Boston’s finest establishments, Flour Bakery & Cafe. We talked about food, photography, and our beloved home state, California. She is brilliant in every single way a person can be brilliant. Not to mention, she is an incredibly beautiful and humble lady. I brunched with Liz of Floating Kitchen, one of my oldest reads, at Cafe Luna (a must try if you’re in the area!) over the weekend. She is the gal who roped me into the networking side of blogging by passing a Liebster award to me (and I must shamefully confess the post is still hanging out in WordPress draftland). 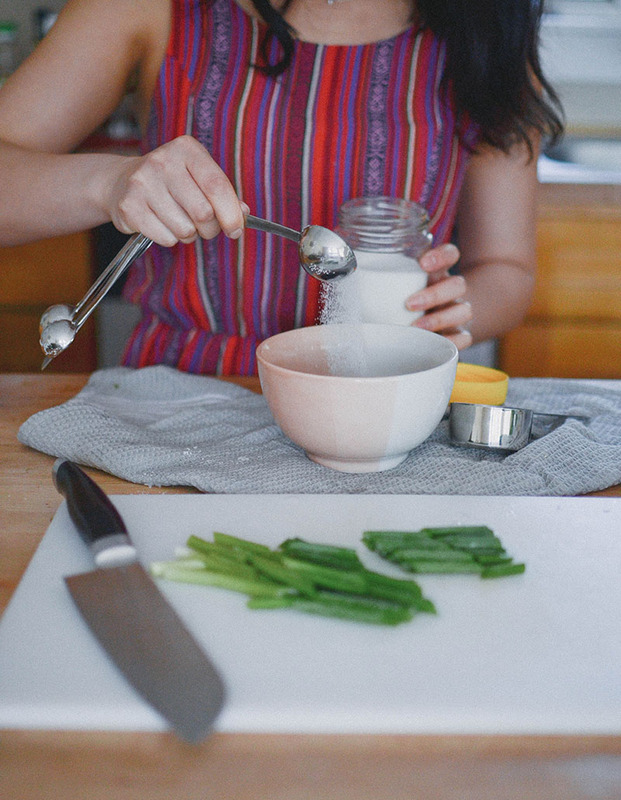 Like the new girl in school, I knew no one when I started Sprig and Flours, and Liz, the effervescent ball of love and life that she is, virtually linked elbows with me and in a way, pulled me out to join the others on the food blogger playground. The other day I was chatting with a friend from work/fellow Californian. As we talked about the shady, green hiking trails and the big, open beaches in California, I immediately felt a yearning to be back there. The raw land is what I miss the most (inhabitants aside). California sits on such beautiful land, along the coast and covered in mountain ranges – it’s no wonder the masses are flocking there. It was hard to appreciate it when I was living there, but I will never deny that California is a gem, one of a kind. Having spent most of my life in the Bay Area, I was spoiled by the prolific Vietnamese food community. 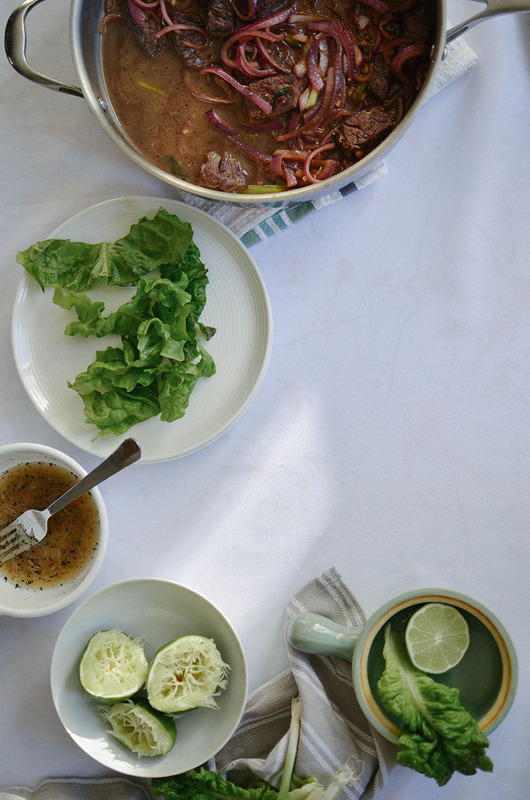 Pho made by people with little to no degrees of separation from Vietnam. Spicy, authentic, and highly addicting bun bo hue. Crispy bun xeo, filled with shrimp and pork, then dipped in the most amazing fish sauce. Creamy avocado smoothies for days! 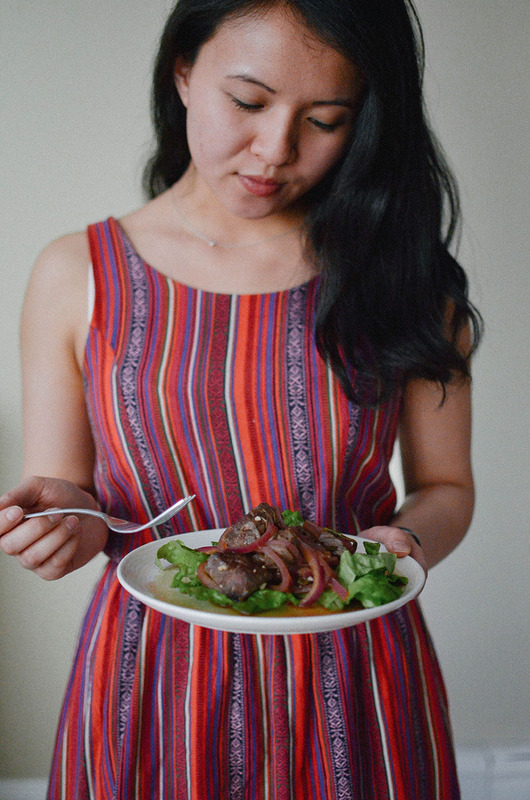 Vietnamese food and California are closely associated in my mind, and because I miss them both so much, I made Vietnamese shaking beef, or bo luc lac, to soothe the ache in my heart (and also the hunger in my stomach!). Tender beef is coated with sugar, then seared in hot oil in a large saute pan. When you add the vinegary sauce to the meat, you shake the pan to coat the meat, hence, shaking beef! Butter and garlic are also involved, so yes, this dish is very rich and so incredibly delicious. 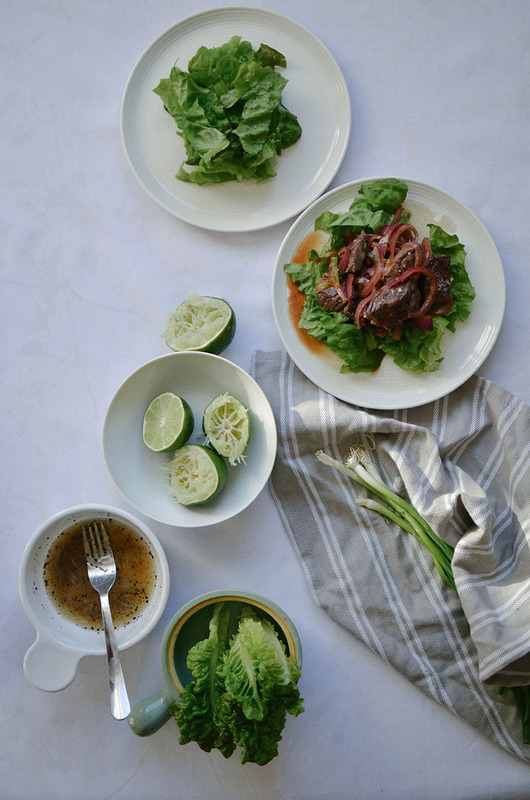 The shaking beef is served over a bed of fresh red leaf lettuce and with a simple lime dipping sauce. It takes less than 20 minutes to whip up, so it’s a great dish to serve during the week when time is not on your side. However, the beef does need to marinate in sugar, salt, and freshly ground black pepper for at least one hour. 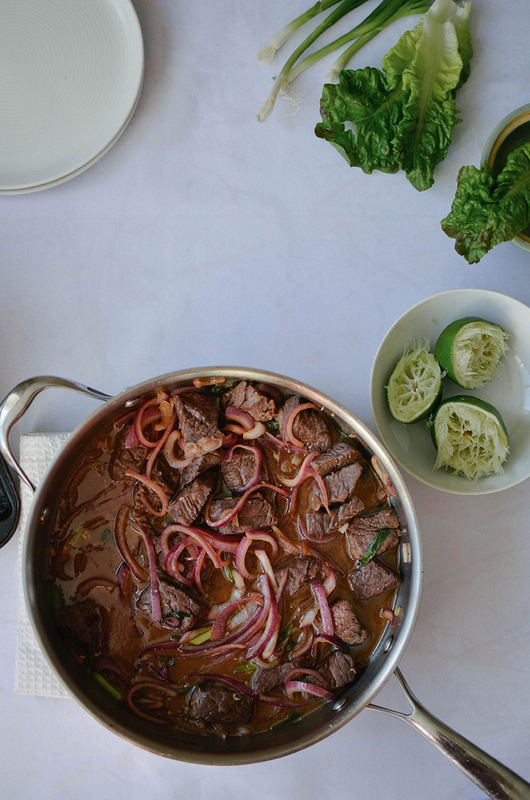 This awesome recipe was adapted from Charles Phan’s shaking beef recipe in the Slanted Door cookbook. One of my dearest friends, Isheeta, sent me the cookbook last Christmas, and it is PHAN-nomenal (hehe). I love every single page in this book, just like I love every single cell in Isheeta. So if you’re a displaced Californian, come on over and we’ll eat our feelings together! I am making some minor changes around here. You’ll see a new post every Monday now and occasionally Thursdays too (thanks to Liz’s awesome advice). I recently switched over from editing my photos in Adobe Photoshop to Adobe Lightroom. My life is changed forever. I am also experimenting with VSCO film – it’s a really neat product, especially handy for inept food photographers like myself. Karl, during his last visit, brought me our tripod from California. You will probably see more of me (or at least my hands) in future posts! Finally, I am incorporating my 35mm lens, which had been spending most of its young life idle in the camera bag, to my photoshoots. In a large mixing bowl, combine the beef, 1 tablespoon granulated sugar, 1 teaspoon salt, and 1 teaspoon freshly ground black pepper. Stir to combine, then cover with plastic wrap. Refrigerate for 1 to 4 hours. 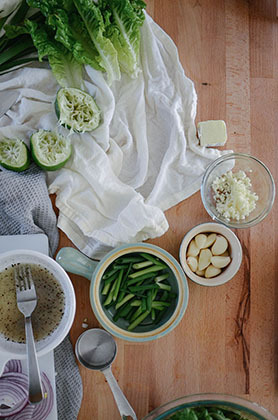 In a medium bowl, whisk together the rice vinegar, rice wine, soy sauce, fish sauce, and 1 tablespoon granulated sugar. In a large saute pan, heat up ⅓ cup canola oil over medium-high heat. 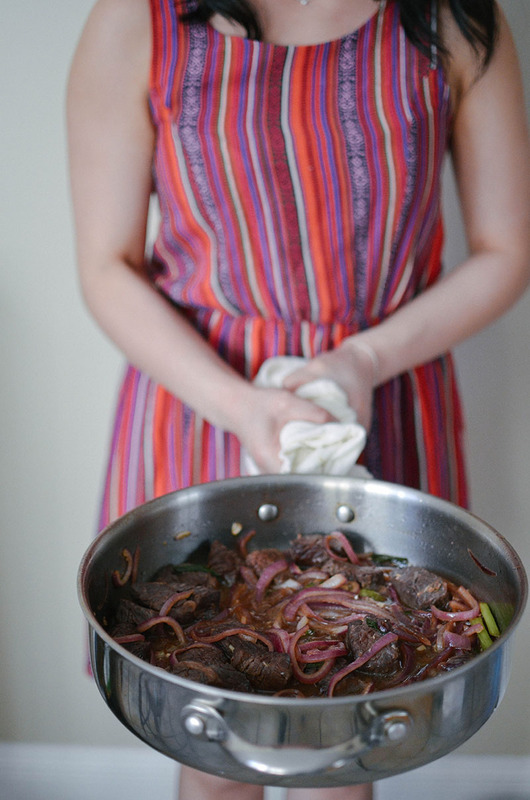 Place the beef in a single layer into the saute pan. Sear for 3 minutes, until a brown crust forms. Flip the cubes, and sear the other side for one minute. Add the red onions and green onions, then stir and cook for 30 seconds. Add the soy sauce mixture and shake the pan to coat the beef. Add the garlic and butter, and shake the pan again to evenly distribute. Remove from heat. 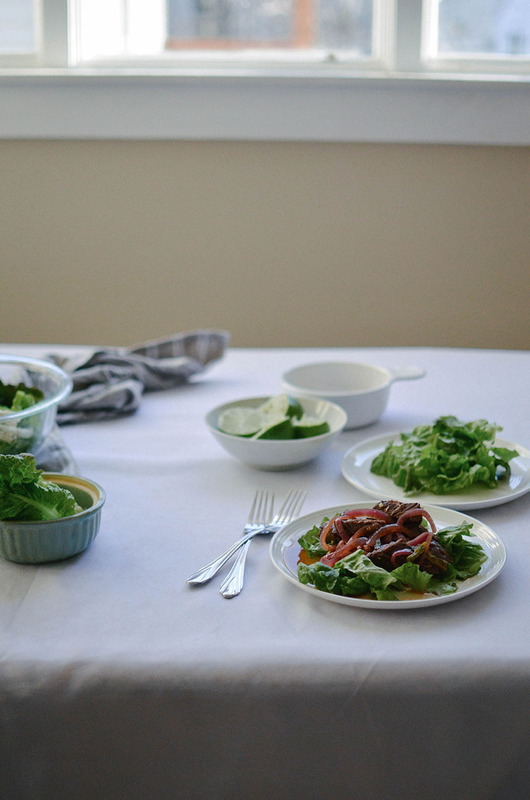 Plate the beef directly on top of a bed of lettuce. 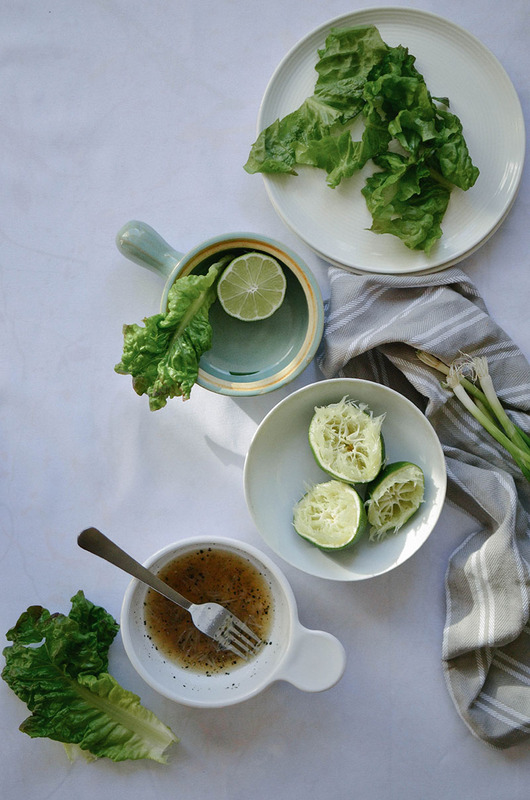 In a small bowl, whisk together the lime juice, ½ teaspoon salt, and ¼ teaspoon freshly ground black pepper. 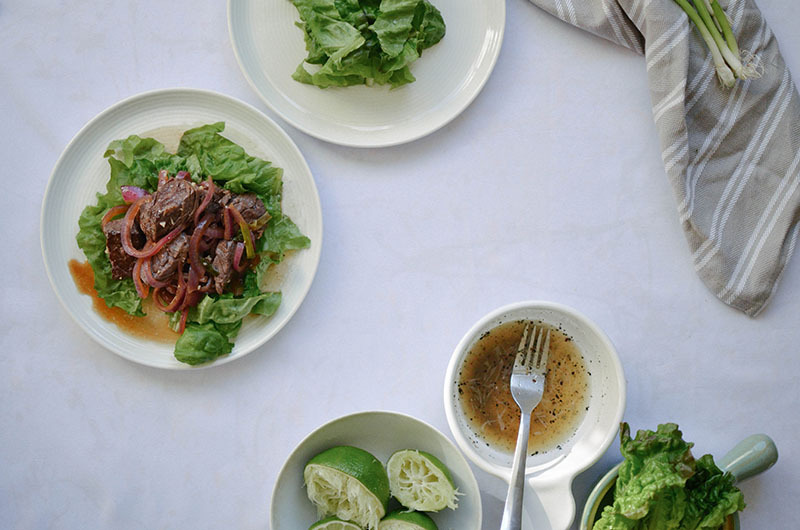 Serve alongside the beef as a dipping sauce. This entry was posted in Entrees and tagged beef, fish sauce, lime juice, red leaf lettuce, rice vinegar, rice wine, soy sauce, Vietnamese. Awwww 🙂 I’m happy that this cookbook is bringing you joy hehe! Vietnamese is one of my favourite cuisines. The flavours in this are very familiar but I haven’t actually made this exact dish. I am pretty sure I have had it at restaurants though I just don’t recognise the name. Without a doubt, it is one of my favs too!! You should def give it a try. Me thinks you’ll really enjoy it. And thank you so much for the sweet compliments!! Hubs and I love Vietnamese food and I just know he will truly enjoy this dish. Looking forward to making it for him. Thank you, Marcie!! The flavors are so simple and unique – a stunning combo indeed! Ooooah you’re from the Bay Area!? My future in laws live in San Jose (my fiance is Viet-French-Chinese) and his mom makes excellent Viet food/ they eat at awesome Viet restaurants so I need to collect some good Viet recipes so I can feel him equally well down in Texas haha. This looks delish! Looks amazing and your photos are stunning girl! I missed Vietnamese food soooo much when I was living in DC! I’m so glad to be living in the Bay again! This dish looks soo good! Such a beautiful dish, Connie! Your photos are stunning! I dragged the family to The Slanted Door the last time we were in SF—they were looking for burgers and fries, but I had to have my fix. This shaking beef looks fantastic! Hahaha I bet they were thankful you did (; I think the Slanted Door is a must try if you’re in SF! Thank you so much for your sweet compliment! Thanks Jo!! Vietnamese food is so unique and addicting isn’t it? When I lived in the Bay Area, I’m pretty sure I had it at least once a week! Vietnamese food is so easy to make – all you need are the right ingredients! Connie, the beef in that skillet made my mouth water – YUM. You can come and cook for me anytime, because this looks amazing! Thank you so much for stopping by and for the sweet compliments!!! yummy! 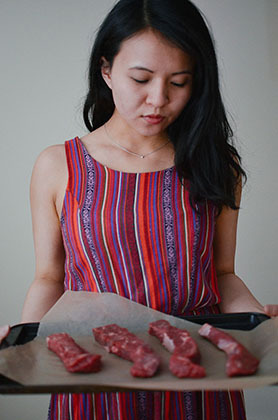 I’ve never had bo luc lac before, but after reading this post it is on my list of to-try dishes! Haha.. inept photographer. I don’t think so!! You photos are gorgeous! And making me so hungry! You are too sweet, Cathleen! Thank you!! I love the spicy tangy taste of this dish, so appetising and refreshing. 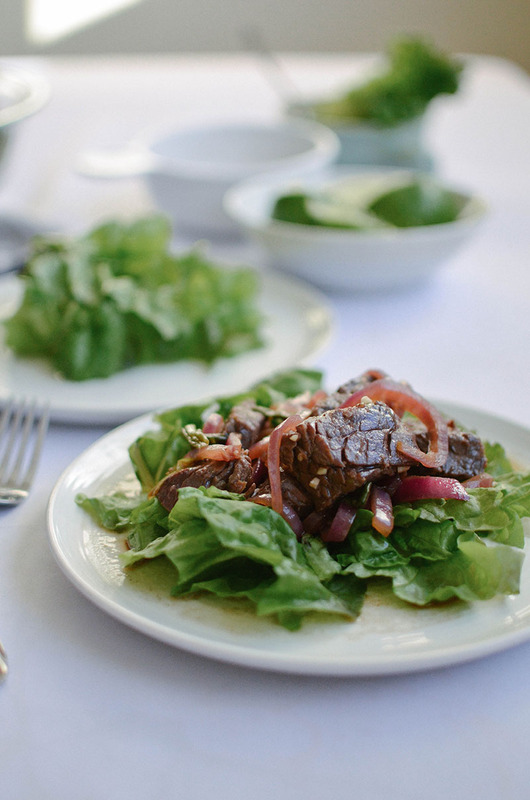 Bo luc lac is flavorful, super fast to make, and even comes with a side salad hehe. What’s not to love? Very nicely done Connie! Digging the other Vietnamese recipes you have here as well :). Keep up the great work!